KoSA 22 finally in Montréal! Montréal-Canada: The world renown drum camp The KoSA International Drum & Percussion Workshops founded by Aldo Mazza and his wife Dr. Jolán Kovács, is holding its 22nd edition in the beautiful province of Québec (Canada) on the magnificent island of Montréal. Choose a registration option below. We recommend secure online registration. 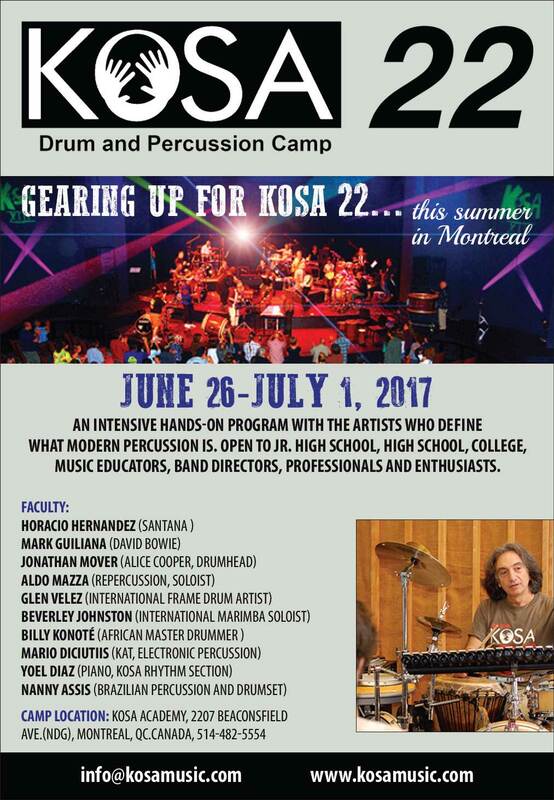 KoSA will host the workshop at the KoSA Academy (2207 Beaconsfield Avenue) in the Notre- Dame-de-Grâce (NDG) borough of Montreal. Conveniently situated, NDG is only 20-minutes from the International airport Pierre Elliott Trudeau(YUL) which is served by all major domestic and international carriers and all major rental car companies. * Please note that there is no need to sign up for a specific class. All participants follow the same schedule carefully designed by the directors. 625$ US or 790$ CAN. Register using the buttons below. A 50% non-refundable deposit must be given to reserve your place in the program. Space is limited! All final payments are due by June 9, 2017. The program costs cover all daily classes, jam session and finale concert. Please note! The program price does NOT include transportation, lodging and meals. 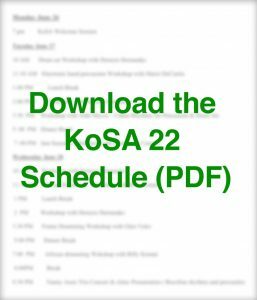 All participants of the KoSA 22 program must arrange their own overnight lodgings. KoSA highly recommends and has secured a special price arrangement at the Concordia University Grey Nuns Residence. The residence is ideally located to public transportation (bus and subway line) as well as Montréal’s vibrant night life. Click here to book your room online and enter the code Kosa2017 take advantage of the special price and secure a guaranteed reservation. If you prefer, you can call (514) 848-2424 ext. 8000 or email [email protected] and mention the KoSA Drum and Percussion Workshops. All rates are per person. No refunds will be issued after the start of the event. No partial refunds will be issued for any workshop activities missed. All cancellations received before June 9th, 2017 will be refunded less 50% of the program cost.